You never know how important it is to have a plunger at home until someone in the family clogs the toilet. When our toilet clogged, I resolved to buy the best toilet plunger I could find. I wanted one that everyone in the family could use successfully. If you’ve ever had to unclog a toilet, you know that the design of the plunger makes all the difference. I wanted our new plunger to do the job as quickly and as neatly as possible with the least amount of effort. After researching, I purchased the simplehuman brand toilet plunger. Not only was it powerful, it came with a nifty cover to keep things neat and clean. In my opinion, the best toilet plunger for my home is this one from simplehuman. I like it for several reasons. One, the flange on the rubber cup fits perfectly in my toilet. The tight seal it creates allows me to plunge with less effort and get quick results. If you’ve ever tried to use a plunger with the wrong size or shape of a cup, you know how difficult it can be to clear a toilet. Two, the handle is made of stainless steel. It feels very sturdy. I like the handle because it’s long enough to be comfortable to use and has a rounded top that fits into my palm. Three, the plunger comes with a dome-shaped base that hides the cup from view. The cover has a magnetic lip so it stays attached to the steel plunger handle, but it isn’t hard to remove. I can lift the whole thing at once by gripping just the handle. I love having the cover so the plunger doesn’t drip toilet water on the floor. Four, the white-tipped handle and white dome cover look neat and clean in my bathroom. The manufacturer offers this plunger in black in case you prefer that color. Now, there are a couple of potential cons with the simplehuman plunger. I’d seen a couple of user reviews that said the handle may rust if the plunger is used a lot. I haven’t seen that happen to mine yet. Also, keep in mind that the cup shape on this plunger may not be ideal for your style of toilet. The flange works better on toilets with a narrow opening at the bottom of the bowl. In a nutshell, here’s a quick summary of this plunger. Of course, before I purchased this plunger, I researched other options. I’d like to tell you about them to help you choose the best one for your home. Where the simplehuman plunger is tapered to fit in modern toilets, the Neiko 60166A plunger has a large wide rubber cup to accommodate all types of toilets. The cup’s flange tapers down in gradual steps to seal tightly against various sizes of openings. The plunger works at any angle. The cup also has no internal ridges so water doesn’t stay trapped inside. The aluminum handle is lightweight but sturdy. It’s also resistant to rust. 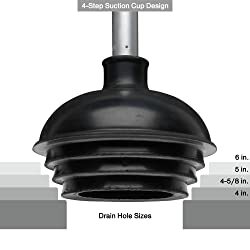 Although there is a hole at the top where you can hang it on a hook or nail, there is no cover or base to hide the plunger or keep toilet water from dripping onto the floor. The main con for me is the narrow top of the handle. The top is rounded but small, not comfortably molded like on the simplehuman plunger. Pushing down on the end of the handle isn’t pleasant at all. While the Neiko 60166A fits nearly any toilet, the next plunger fits most American models, plus the handle is easier to use. The Korky 99-4A struck me as a no-nonsense plunger. Like the simplehuman model, the Korky has a tapered flange that fits down inside a toilet bowl opening to create a tight seal. The large rubber cup gives it a great deal of power without a lot of effort. Korky says their 99-4A fits American Standard, Kohler, and TOTO model toilets. Some users who claimed to have one of these brand toilets complained that the 99-4A doesn’t fit their particular model. You might want to double-check your own toilet if you want to purchase this plunger. On the upside, the plastic handle has a grip bar at the top. This makes it much easier to control while plunging. It feels much nicer in the hand than the Neiko plunger does. And for those who prefer to buy American-made products, the 99-4A is made in the USA. There is one more toilet plunger I discovered while researching. You might prefer it for your home if you’re looking for a smaller design. Blue Donuts artfully disguised their Aerated Toilet Plunger in a ventilated metal container. It looks exactly like it’s a toilet brush until you pull it out of the can. Then you can see the black rubber cup with the narrow flange. If you want to thoroughly hide the fact that you have a plunger in your bathroom, this might be the one to get. The metal container is handy because the cup of the plunger has an internal lip that retains a little water after plunging if you don’t take the time to shake it well. But once you store the plunger in the can, it can drip dry. The metal handle has a rounded end so it’s reasonably comfortable to hold and use. The lid to the container is permanently attached to the handle. This is a bit annoying because the plunger handle is short. You may find yourself scraping your toilet bowl with the lid as you work. If you want a plunger that can be hidden completely but still is handy, this might be the one for you. It comes in both Bronze and Chrome colors. All of these plungers have good features. It just depends on what you want for your home. The simplehuman plunger is working very well in my house. In order to choose the best plunger to help my family clear toilet clogs, I did a lot of research. Price wasn’t a big issue since these are inexpensive items. Instead, I considered what the manufacturers said about their products and also read many user reviews. I came up with certain criteria to help me choose the best plunger for us. I hope that these features can help you decide which plunger meets your needs, too. If the plunger makes a tight seal, it will force water out of the toilet more quickly and with more power, clearing the clog. A large cup size allows the plunger to hold more water and send more volume through at once. This also increases power and efficiency. Since plunging takes some strength and effort, a strong and comfortable handle is essential. A protective container isn’t essential for everyone. I preferred it so I can keep the plunger at hand in my bathroom. The cover disguises the plunger and keeps my bathroom looking neat and clean. If you plan to have your plunger out where it’s seen, you may want to choose one that matches the style and color of your bathroom. Having the best toilet plunger did two things for me. I stopped worrying about toilet clogs at inconvenient times because now I could clear them quickly. I also feel better knowing that the plunger is easy enough to use that anyone in the family could take care of the problem if I wasn’t home. With that said, I’d like to recap what I liked about each plunger so you can decide if which one is the best for you. simplehuman Toilet Plunger – The narrow flange on the large rubber cup forms a tight seal in modern toilets. It has a sturdy stainless steel handle with a large rounded top. 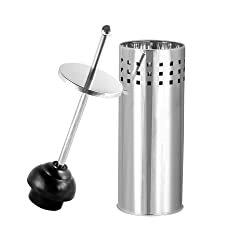 The magnetic base hides and secures the plunger, and protects against dripping. The base and handle come in two color schemes. If you ever need a new cup, the plunger head is replaceable. If you prefer an elegant plunging solution for your bathroom, consider my personal favorite, the simplehuman plunger. It will help you clear a clog with the least effort possible and keep the mess to a minimum. Neiko 6-166A Toilet Plunger – The gradually tapered cup fits any toilet and works at any angle. The aluminum handle is lightweight and doesn’t rust. If you have a variety of toilet styles in your home, the Neiko 60166A has a large cup that fits almost every sit-down flush toilet found in homes today. 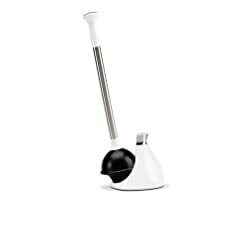 Korky 94-A Toilet Plunger – Its large rubber cup has a lot of power and tapers to fit most American toilet models. The plunger itself is made in the USA. The plastic handle has a unique grip on the end that is comfortable to use. 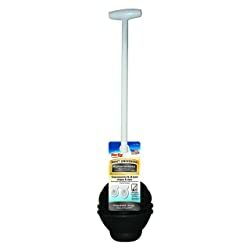 If you perform maintenance and need an inexpensive plunger in your tool kit, the Korky 99-4A fits most models of toilets. It’s powerful and comfortable to use. Blue Donuts Aerated Toilet Plunger – This plunger comes in two color schemes to better match your bathroom. The metal container completely hides that this is a plunger. It also allows the plunger to drip dry without making a mess. The handle is short, but the rounded end is pretty comfortable to use. If you want a small plunger that is completely disguised, take a look at the one made by Blue Donuts. I like my new plunger because it helps me take care of clogs without wasting time or getting stressed. Thank you for reading this review. I hope it helps you choose the best toilet plunger for your needs.